The Psychology Department now consists of 26 faculty thanks to its three newest hires: Christy Byrd (left), Audun Dahl (middle) and Rebecca Covarrubias (right). What do The Hunger Games, kids helping kids, and acting too-cool-for-school all have in common? 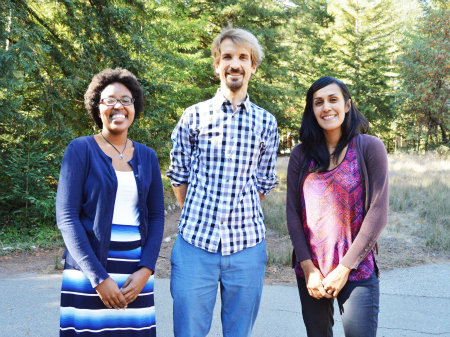 They are all topics the newest faculty at UC Santa Cruz’s Psychology department explores with their students. Byrd and Dahl joined UCSC in 2014. Prior, Byrd was a National Science Foundation Minority Research Fellow at Michigan State University (after attaining her doctorate at the University of Michigan). Dahl came from UC Berkeley where he completed his PhD in Developmental Psychology. Covarrubias started in 2015 after a postdoctoral research fellowship at the University of Delaware. “Professor Byrd really knows how to engage her students with the discipline,” says Leaper. In Fall quarter, Professor Byrd started teaching a class that applies character and plot development from the best-selling Hunger Games trilogy to theories and concepts in developmental and social psychology. “The books really expose psychological issues and processes,” says Byrd. When Byrd is not teaching a class on Hunger Games, she explores the psychological well being of students. Currently, she is studying students’ experience of microaggressions - the subtle ways assumptions and attitudes based on race, sexual orientation, or gender are communicated in everyday conversation. Often these slights are unintentional, but come with hurtful consequences. As part of her study, Byrd recently launched a mobile app (see MicroReport) as part of her study on microaggressions. The app encourages UCSC students to report the microaggressions they experience or witness in the community. App users can also view reports of others and are encouraged to talk about these experiences in a series of workshops Byrd is organizing. “From designing a mobile phone app to addressing issues impacting people on our campus and across the country, Professor Byrd’s research is both innovative and timely.” Leaper says. Professor Dahl's research explores the early moral development in children. He runs the Early Social Interaction Lab, where he studies how kids responses in social situations. Specifically, he looks when young children help, but also hurt, others to better understand how a sense of right and wrong develops. “I always found it interesting how we can be so sure about something being right and wrong,” says Dahl. He thinks back on his childhood when two of his friends stole from him. Now he tracks how these types of moral convictions develop in children. At his lab, he combines experimental research with naturalistic observations to see when kids make judgments of right or wrong behavior. Professor Covarrubias is the newest faculty member in the Psychology department. A social and cultural psychologist by training, her work shows how people, particularly underrepresented and diverse individuals manage these multiple worlds: school, work, home, even the doctor’s office. Currently, one of the projects Professor Covarrubias is working on examines how first-generation college students adjust to college life. She explores issues they face both on campus and at home, including emotions like incompatibility and in some situations, even guilt for their academic accomplishments. Covarrubias explores barriers to achieving academic success and is keen to find ways to address these obstacles. “With UC Santa Cruz now a Hispanic Serving Institution and 49% of our majors first-generation, the topics Professor Covarrubias examines is particularly relevant here in the department and on campus--as well as the country,” says Leaper. “Understanding the path to academic success is imperative,” he adds. The Psychology Department welcomes these three new faculty members!